* 12 no. H20 B (3768 mm2) used to suit final link arrangements. 12 no. H25 used to suit final arrangement of links. = 5.38 x 0.9 x 252 x 434.8 x 2.5 = 1326.3 kN Maximum shear at support = 517.9 kN i.e. capacity of minimum links not exceeded. 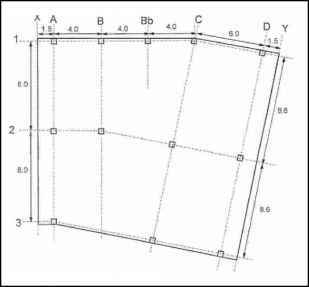 By inspection, the requirement for indirect support of the ribs of the slab using 87 mm2 / rib within 150 mm of centreline of ribs (at 900 mm centres) and within 50 mm of rib/solid interface is adequately catered for and will not unduly effect the shear capacity of the beam.